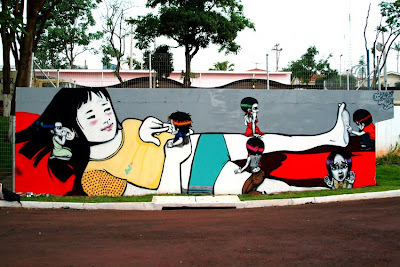 Finalmente em Americana, nos pintamos uma releitura do Gulliver, numa versao feminina, no Centro de Cultura e Lazer. Finally in Americana, we painted at the Culture and Entertainment Center from the city a female version from the Gulliver story. Wow! It's so great! I'd love to see it in person. I love your work. Yor work it's a gift for me. ah valeu mestre gostei dessa interação dos dois estilos ae!